Number of Chapters and number of members has changed what used to represent an organization based on friendship and Fraternalism into a way to make money for some individuals and sometimes an attempt at monopoly on U.S. campuses. Alpha Delta Gamma National Fraternity’s smaller size is our biggest attraction. Because we only have a few Chapters, it places emphasis on True Brotherhood rather than emphasis on what has become the big corporate business of a National Fraternal Organization. ADG’s Goal of Expansion is not a large-scale assault to gain as many chapters in this nation as possible. Our Goal is to help college students find an alternative solution to what is sometimes seen as the on-going negative norm of Fraternity life. 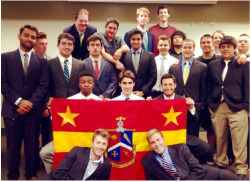 Our Goal is to prove to campuses that a Fraternity is something more than just a social organization. And most importantly, our Goal is to provide the means of Brotherhood and the fostering of a well-balanced, well-rounded college male. Bringing Alpha Delta Gamma to your higher education institution provides you with the ability to be a trailblazer – a true leader – on your campus. You will become a Founding Father to which even years after your graduation, your Chapter’s members will reap the benefits of your hard work and determination. You will be making a difference in people’s lives as well as leaving a lasting legacy at your alma mater. Visiting this web page is your first step at taking on expansion efforts. Later, you and your group of interested friends will be upgraded to the status of Colony. Should all be in order, a Chapter of ADG, a Regional Expansion Director, local Alumni, and even members of the National Executive Council will be involved in your colonization. Such a highly interactive approach ensures that you will have whatever means necessary to start to realize the Brotherhood of Alpha Delts and why we have such a deep regard for it. Further Questions? Please continue to visit these Expansion pages and/or please contact the Vice President of External Affairs at vpexternalaffairs@alphadeltagamma.org for further information and the next steps of Alpha Delta Gamma Expansion.